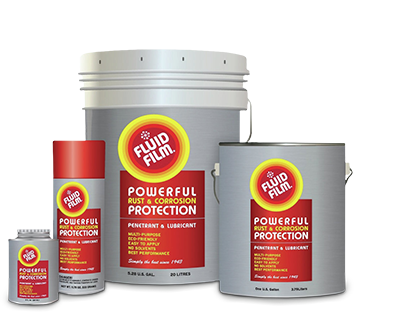 FLUID FILM Liquid A is an anti-corrosive coating, lubricant and penetrant for all metals. It provides protection against attack by moisture and salt solutions, and may be applied to soften and remove heavy rust. It is excellent for storage or shipment of metals and equipment, and is used in the maintenance of aircraft, heavy machinery, marine equipment (such as rudders, voids, inaccessible areas), mining equipment, farm machinery and automobiles. It is also used in refineries, salt plants, power plants, and gas companies. Where fluid (soft coating) barrier is not objectionable: LIQUID A will protect liquid fertilizer tanks, bulk storage tanks, hoppers, spreaders, collection tanks, sprayers, liquid applicators, combines, mixing plant machinery, sorting machinery, conveyors, elevators and vehicles. LIQUID A will protect the interior of pumps by pouring into intake and turning pump over once or twice to make sure liquid is coating. LIQUID A stops the rust, inhibits the corrosive properties of fertilizers, lubricates all moving parts and displaces moisture. To coat small tanks with limited access, pour LIQUID A into the access hole. The estimated coverage rate is as follows: 1.22 liter / m 2 or 3 gallons / 100ft 2. Roll tank to cover all surfaces. Fill tank slowly with water and drain until coating has gelled and placed itself on tank surfaces. May require 2-3 cycles. If conditions dictate a heavier coating or lubricant, refer to other Eureka Chemical product bulletins or Eureka Chemical Company. Can be applied under ambient conditions by airless spray, roller, brush, dip, slush, floatation. Used as coating and lubricant. Will penetrate to the core, displacing moisture. For long term protection; FLUID FILM wire-rope dressings, WRO-EP MIL-PRF-18458 C or WRN-EP are applied after FLUID FILM LIQUID A is employed as a penetrant. This procedure eliminates the use of a mechanical lubricator for core penetration. FLUID FILM LIQUID A meets and exceeds the corrosion performance requirements of MIL-C-16173 Class 2 Grade 3 while containing no solvents. LIQUID A remains active, penetrating to the base metal stopping corrosion. With LIQUID A there is no pinholing since it is self-healing, as opposed to a dormant passive barrier. LIQUID A can be applied by spraying or brushing to a thickness of 2 to 3 mils. Coverage rate is 1600 m 2 / 208 liter or 17,000ft 2 / 55 gal. drum. No sandblasting required. Remove flaking rust and peeling paint. Break blisters larger than 25 mm (one inch). Remove all standing water. Clean up all debris and silt. If long term protection is not required and time does not permit surface preparation, application may be made over existing rust and seals. LIQUID A will soften this rust and it may fall, leaving surface unprotected. Therefore surface inspection may reveal the necessity for touch-up. Floatation application of LIQUID A can be accomplished with results that will reflect the degree of care taken to achieve proper application. To apply a uniform film of LIQUID A, it is imperative to coat all metal surfaces with LIQUID A before its exposure to water and subsequent gelation. Indiscriminate dumping of LIQUID A into water with any mixing action accelerates the gelation of the product. This induced premature gelation is adverse to proper surface application and can lead to LIQUID A wastage. It is preferred to hose at least 25% of the Liquid A onto the tank overhead, the upper vertical surfaces and the tank bottom. Positive placement will make for better coverage and distribution. Apply the remaining LIQUID A to tank assuring as much distribution as practical, especially in large tanks. Add ballast water slowly, raising the level of water as high as practical without causing overflow. Deballast slowly stopping short of the suction bell. When the application is made by pouring or pumping the coating into the tank, apply approximately one third of the required material initially to the tank bottom, followed by ballasting to one-half of tank level. Add another one-third of material to the tank then deballast to above suction bell; re-ballast to two-thirds tank level, add the remainder of material and continue ballasting, raising level of water as high as practical without causing overflow. Repeat ballast and deballasting cycles until all material is placed on steel. 2 - 4 cycles should be sufficient. Coverage rate for light and moderately rusted tanks is approximately 510 m 2 / 208 liter or 5,500 ft 2 / 55 gal. Drum. For heavy scale deposits the calculated coverage should be 204 m 2 / 2,200 ft 2 per drum. Please be advised the floatation method cannot insure 100% coverage of all surfaces. We recommend direct application whenever possible. LIQUID A can be used as a descaler to soften heavy rust and scale. After 6 -12 months, tanks can be readily scraped and mucked out, then LIQUID A can be re-applied, with approximately 1 to 2 years service as described under "Particulars For Marine" above. A longer term coating such as LIQUID AR or GEL BW may be used. Oral: LD50 greater than 3 g/kilogram. Skin Irritation: Non-irritating response. Albino rabbits - 24 hr contact of LIQUID A on intact and abraded skin. Eye Irritation: Very slight response. LIQUID A inserted in rabbit's eyes. On immediate washout, slight response after 24 hours. None after 48 hours. With no washout, slight response after 24 hours. None after 72 hours. Note 1: When welding in tanks coated with LIQUID A, wipe material back a distance of 1.5 meters (5 feet) from where hot work is to be performed and from the deck area beneath the hot work. See Technical Bulletin No. 202.2. Note 2: Since LIQUID A forms a gel in the presence of water, keep all containers closed tightly when not in use. If LIQUID A thickens in the container, agitation will temporarily return it to a more liquid condition. Thickening does not impair its effectiveness in any way. Note 3: LIQUID A is not recommended for use in tanks carrying petroleum solvents, acids, ammonia or ammonium hydroxide. Solution of ammonium salts may cause slow degradation of the coating. Note 4: Shelf life – indefinite. All components of FLUID FILM® LIQUID A are listed on the TSCA Inventory.